Ravoso Aryon is a Dunmer pawnbroker who lives at Oran Manor in Suran. She has a decent selection of items for sale. 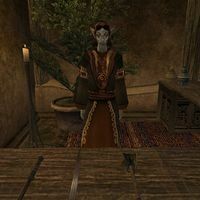 Ravoso Aryon also appears in the Houses of Morrowind card expansion for Legends as the card Suran Pawnbroker. This page was last modified on 11 March 2019, at 19:43.